I eat pretty much whatever I see! New, limited edition items are my favorite. The day I was scheduled to fly back to NYC from Tokyo, typhoon number 9 was hitting Japan and my flight got canceled. The next day I took a flight and luckily I was bumped up to business class. My husband said I should reserve Japanese food for the in-flight meal because sometimes it runs our as the quantities they prepare in the plane are limited. He called and requested the Japanese meal in advance so that I could have it without a problem, and even the check-in counter staff knew, besides the flight attendants in the business class. When I boarded, they welcomed with orange juice, champaign and Asahi beer, and as I don't drink, I got a glass of orange juice. Under "Japanese Selection," it says you can reserve 24 hours in advance as limited numbers are available. Roast Beef with Wasabi Cream and Soy Sauce with Pickled Tomatoes. The soy sauce was actually jellied ponzu, citrus flavored soy sauce. Nimono (煮物) is a slow-simmered food. There're Simmered Shrimp and Summer Vegetables (string beans, kabocha pumpkin and pickled shallot). There're Black Tea Marinated Tuna Sashimi, Corn Dumpling, Asparagus Wrapped in Wagyu Beef, Deep Fried Ayu Fish with Arima Sansho Pepper and Taro Potato with Black Sesame Jelly. It's Nata de Coco marinated in Oyster Soy Sauce with Vegetables and Salmon Roe. Shusai (主菜) is main dish. There're carrots, mushroom, green onions and mashed edamame. There're eggplants, fried tofu and seaweed. Eggplants, daikon radish and ginger. On a counter, there're these snacks and fruits besides water bottles. 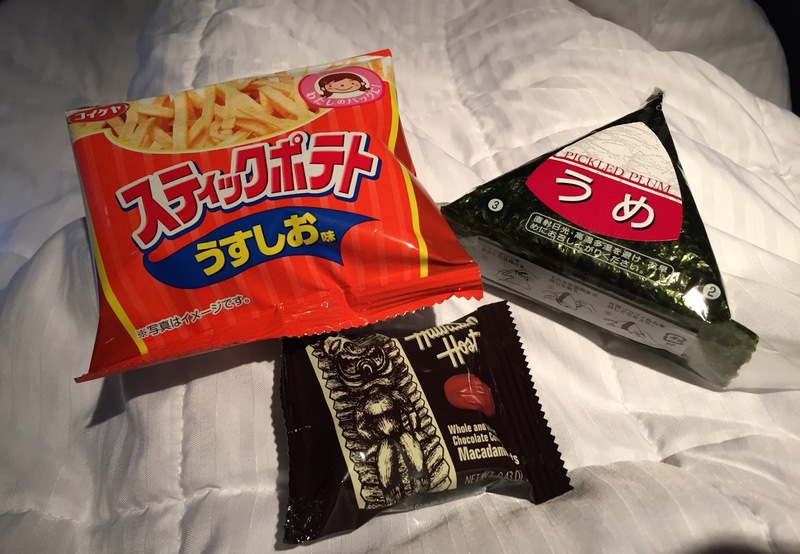 I got a bag of stick-shaped potato chips, a rice ball with pickled plum and my favorite snack all-the-time Hawaiian Host chocolate. I chose Spinach and Cheese Omelette with pork sausage, asparagus and fried potatoes. There're also a croissant and fresh fruits. In the business class, they serve dishes one by one like a course menu so that I could eat at my pace. The flavors and qualities were incomparable to those served in economy class. Taking photos is one of my hobbies. I've taken tons of photos of food and tried new plates I was interested in. Thanks to my friends' idea, I started this blog. It's like my footsteps of my food journey.